In 1988, Conny Bloom formed Electric Boys with bassist Andy Christell in Stockholm. 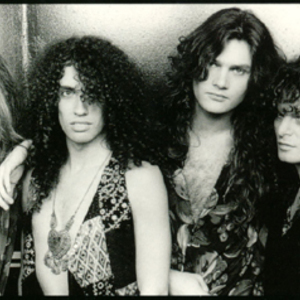 After scoring a significant domestic hit with their first single, "All Lips 'N' Hips," the group completed their line-up with guitarist Franco Santunione and powerhouse drummer Niclas Sigevall and set to work on their first album, 1989's critically acclaimed FUNK-O-METAL CARPET RIDE. Signed to Atco by former Kerrang! scribe/ turned A&R man Derek Oliver, the band took Europe and the U.K. by storm with their extremely funky retro-hard rock sound and gaudy psychedelic look. The debut album was a success in Europe, and they picked up a strong following in Britain, where as well as headlining small clubs they supported Thunder. Electric Boys second album, GROOVUS MAXIMUS (1992) was recorded in Abbey Road studios and showed a great melodic improvement in songs like the single "Mary In The Mystery World" and "Dying To Be Loved" combined with their trademark grooves. After intensive touring following the release, personal issues led to a split of the band, enter guitarist "Slim" Martin Thomander and drummer Thomas Broman. The band started working on new heavier material (According to Conny: -"Too many bands are doing what we started nowadays and this funk-rock band wagon is gettin out of hand"). First gig with the new line-up was supporting Metallica. Groovus Maximus did not emerge until 1992, by which time grunge had swept all before it and the album was overall inferior to the debut. By the end of an American tour to promote it supporting Mr. Big, the band had lost Santunione and Sigevall and both North American and European record deals. Outgoing members were replaced by Thomas Bromann (drums) and Martin Thomander (2nd guitar) and this lineup released the band's third album. Released by Polygram in 1994, their third effort, FREEWHEELIN?, was a more straightforward hard rocking album in the same vein as "stoner rock" before the word had become a cliche. Following the cancellation of a planned European tour supporting King's X, Conny and Andy felt they couldn't take the band any further and decided to call it quits with a final gig in their hometown of Stockholm. Conny Bloom would remain active as a solo artist and eventually joined former Wildhearts main man Ginger in Silver Ginger 5. In 2005, Andy Christell & Conny Bloom joined the legendary Hanoi Rocks and toured since then frequently in Europe & Japan. Hanoi Rocks decided to quit late in 2008 and played a successful tour in Europe and Japan. The tour ended in the legendary Tavastia club in Helsinki, where Hanoi played 8 sold-out gigs in 6 days. Early in 2009 Universal released an Electric Boys collection which after the band had a successful tour in scandinavia and UK. (working title "Welcome To The High Times", to be recorded later on summer 2009). Conny has commented that "It will be a very Electric Boys sounding record, packed with infectious grooves, guitar riffs and sing-a-long melodies. The 4 of us in a room together, one louder than the other.. here & now! ".